I am a sophomore member of the class of 2017 and an archaeology major with a potential second major in Classics. In participating in Recreating Ancient Greek Ceramics, I hope to gain a more comprehensive understanding of the ceramic material I have excavated in the past and will excavate in the future. I am also extremely excited for the opportunity to engage in ceramic manufacture, as the archaeology of craft is one of my special interests, a result of working with a spindle whorl in the JHU Archaeological Museum’s collection last year. Finding ourselves with only five classes remaining until firing and very little physical material to show for our efforts thus far, in this fifth class we dove straight into the processes of surface treatment and formation of the sections of our cups. Attempting to paint with a cat’s whisker. Our first task was to prepare the slip used to paint the cups. Slip is a mixture of water, powdered clay, and deflocculants, which keep the clay particles in suspension (we use soda ash, sodium silicate, and Epsom salt, but what material the ancient Greeks used is still a matter of considerable debate). To create the slip, we simply poured 1500 grams of powdered clay, similar in appearance and texture to cocoa powder, into a tall cylindrical vase about three-quarters full of water. As the mixture settled it formed three layers: sludge on the bottom, mostly water on top, and slip in the middle, which can be extracted relatively easily via suction. Transitioning from slip production to use, the class divided into groups and attempted to recreate the thin, raised relief lines, the thicker, flatter contour lines, and the wide, even fill lines typical of painted Greek ceramics. In general, we found slip a much more difficult medium to use than paint, as it has a watery consistency that does not adhere well to brushes, and dries almost instantaneously to near invisibility. To mitigate these problems, my group decided to follow the suggestion of ceramics scholar Joseph Noble (The Techniques of Painted Attic Pottery. Rev. ed. London: Thames and Hudson, 1988. p. 121) and added honey to our slip. We found that the honey allowed the slip to better adhere to the brush, create a raised line, and remain slightly more visible. 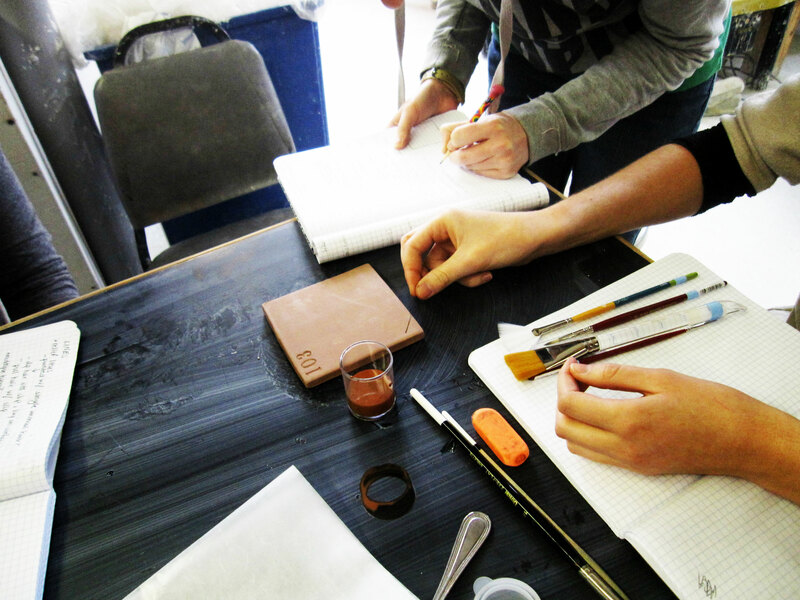 Other groups experimented with the addition of gum arabic to similar effect. For tools, we tried everything from single cat whiskers and horse hairs to brushes ranging from size 000 to over an inch wide. As part of this process, we also attempted burnishing (polishing to a luster), and found that our own fingernails, metal spoons, and highly polished stones worked best to make the dry slip shiny and more visible. 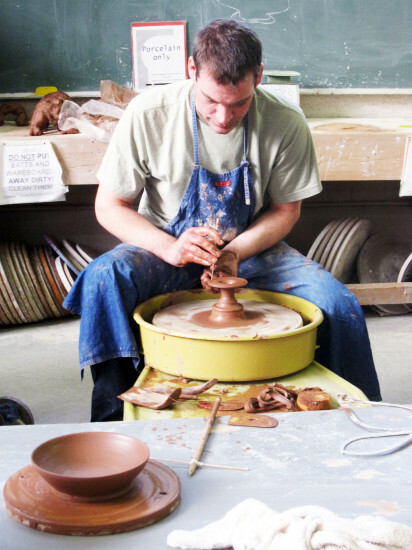 Shifting gears from surface treatment back to vessel formation, the class ended with another opportunity to attempt wheel-throwing, much more successful for many this time around, and a demonstration from Matt Hyleck, in which he produced a bowl, stem and foot, and two handles in an incredibly short period of time. The formation processes of the stem/foot and handles were completely new to us, known only from written descriptions in Toby Schreiber’s Athenian Vase Construction. Matt’s demonstration gave substance to these words as we saw him lift a tall column of clay, widen it at the top, and then ever so gently flatten the rim to create the level foot upon which the cup will stand. The handles, unlike the bowl and stem are not wheel-thrown. Rather, Matt rolled each one out into a “dog bone” shape, a long snake thicker at either end, taking care to use pieces from the same lump of clay to ensure similar shrinkage rates and to bring them through the steps together to make them as identical as possible. This process is not quite what Schreiber describes (Athenian Vase Construction: A Potter’s Analysis. Malibu: The J. Paul Getty Museum, 1999. p. 24), but Matt believes that rolling and then refining with a few pulls at the end is the easiest way to produce handles like those on our cups, which are thicker at the ends but also have visible striations from pulling. The fact that there are different ways to produce the same handles, and even the same lines or slips, as seen earlier in the class, is one of the aspects that makes projects like this so intriguing and vital for a full understanding of the material record. Thanks for your reflection on our last class Anna. After our first attempts to apply slip to the tiles, it became clear to me that we should all lower our expectations for creating thin and precise lines in our designs. That being said, I’m even more amazed that the Athenians were able to produce subtle details as well as evenly painted negative space. From my group’s experience, several coats (at least four) of slip produce a darker raised area compared to the surface of the tile. However, applying several coats affects our ability to create a smooth and even surface as well as clean detailed lines. In order to improve the precision of our lines, I wonder if implementing a subtractive process could help. Unintentional or inaccurate lines and marks could be removed by applying a small sharp point, such as a needle. Of course, this process would have to be executed with small and delicate strokes, as to preserve the integrity of the tile’s smooth surface. I was surprised when the slip was watery. After reading “Evaluation of the relief line and the contour line on Greek red-figure vases using reflectance transformation imaging and three-dimensional laser scanning confocal microscopy” by Artal-Isbrand and Klausmeyer, I think that the relief lines on the kylikes are raised in a manner that is not easily achieved with a liquid whose viscosity approximates that of water. The RTI images in the paper show that they are not as uniform as a line that would result from a watery substance. For example, some lines that the authors examined on a stamnos had what they called a “furrowed profile” (the cross section is “m” shaped), which I don’t think can be achieved without a more viscous slip. In class, my group tried adding gum arabic to our slip. This made it easier to work with, but we certainly weren’t getting any furrowed profiles. I think we should try letting some water evaporate from a small sample of slip to see how it works. However, if the slip gets too thick, it will be incredibly difficult to use. Something I found difficult with the slip was the fact that it seemed to get sucked into the clay rather than rest on top of it to produce a raised line. Adding gum arabic helped, but it still felt too watery to me. There were also few tools that actually held the slip to paint with, and like Anna said, it nearly disappeared after application. If this is what the ancient greeks were working with, then my respect has yet again gone up for them. To me this also shows the importance of tradition within a culture. Despite the unreasonable difficulties faced in creating black and red ware, it was made for hundreds of years. Thank you Anna for the post! The slip application process was far from what one could call “painting”. The slip dried too soon for whatever that is drawn to be visible. The slip is the same color and shade as the clay body of the cups yet after firing the slip is supposed to turn to a glossy black. It is indeed marvelous how the ancient greeks had such patience and dexterity to paint those figures so meticulously. The thing I found most difficult was getting ares of the tile painted with slip to burnish evenly. Burnishing with a fingernail seemed to produce the best effect, but I can’t imagine trying to burnish a whole vessel with just a fingernail. We tried using a spoon, but it left streaks on the surface, and the cloth and polished stone we tried ended up picking up the slip more than polishing it. Maybe the streaking was caused by the direction in which we rubbed the clay (which was in the opposite directionality as the brush stroke) or by the amount of pressure applied to the surface when burnishing. The difficulty of this task gave me a new appreciation for the nearly flawless polished surface of the ancient vessels. I agree with Lauren, I was so suprised when the slip was so watery. When my group started using it on the tiles, it disappeared before we even took the brushes off of the surface! But after we added the honey it was so different. The lines were more defined and visible, which was a problem I didnt even know we would had. Actually working with it and seeing how tempermental it can be means that we’ll have to be more realistic with our designs. I can’t imagine how the ancient painters managed such small details. Thanks for the post! My group didn’t add any gum arabic or honey to our slip and had a very difficult time getting any height off the surface of the clay. I liked using the sharp bamboo instruments since they held the slip well, but as Kelly mentioned, it was easy to scratch the surface. Thin brushes drew lines well but didn’t generate much height either. I think the most important thing to remember is that we are essentially attempting to spread wet dirt, and wet dirt will interact with tools in a fairly familiar manner. Thanks, Anna, for the great post! Riffing on what has been said before, the thin water-like consistency of the slip poses a challenge to producing the thin relief lines and even contour lines we see on slip-decorated ceramics. While the honey did add a roundedness, would it remain that way when fired? As we begin experimenting more with painting our own tiles, I will take into consideration Lauren’s suggestion of allowing some water to evaporate from the slip. Last note: I know we are all in awe of Matt’s skills, but it really goes to show how efficient the master potter can be in producing works. Something that I noticed was that the hair really didn’t seem to be able to hold the slip well at all. One might think that a single hair would have done the trick, but it just wouldn’t hold the slip well enough to be able to apply it to the clay. It seemed like three hairs was more suited to holding the slip, but wouldn’t offer enough control to be able to make all of the intricate lines and patterns. By the end of the class, I was left wondering if hair would even be our plausible option at all! For me at least, the skewers and toothpicks seemed to work far better. I wonder if they could have used a sort of soft wood for this instead of a brush? We are struggling to find the right tools to paint with! In addition, the nature of the clay makes it very hard to carefully paint an image. The clay powder we are using is the same as the red art clay we used to make the tiles. This makes painting difficult for two main reasons: 1. The slip is the same color as the tile! We can’t see where we are painting and will have to make some guide marks to execute our images. 2. The clay tiles are very porous/absorptive so our very watery slip does not sit on the surface for very long. This makes me think about the various theories we have read about how the painters created their images. How fast would they have had to work and was there room at all for error? Also how did they fix mistakes, especially if it affected the surface of the kylix pre-firing? Great post! Regarding your surface treatment, I wonder if your honey-infused relief lines would survive the firing well, because if they’re mostly honey, the organics will just burn out and the raised quality of the lines may be lost. Dr. Balachandran and I were discussing this, and the honey would really need to dissolve well, possibly assisted by high heats. After seeing Matt creating the foot and handles of the pottery, I’ve totally reneged a previous opinion that our finished works should be student-made. While a student can successfully construct a rudimentary bowl shape, the comparatively-complex foot and handle attachments seem out of the realm of feasibility for us. We don’t have multiple firing opportunities, and those components need to fuse and stay. I am glad we are in the company of a master potter.